The Oubliette Issue 8 giveaway ended earlier this week. 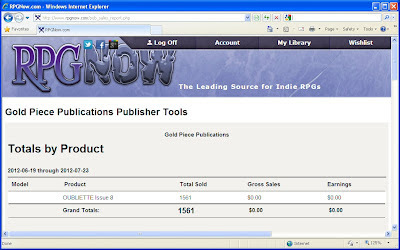 I can report that we managed 1,561 downloads. 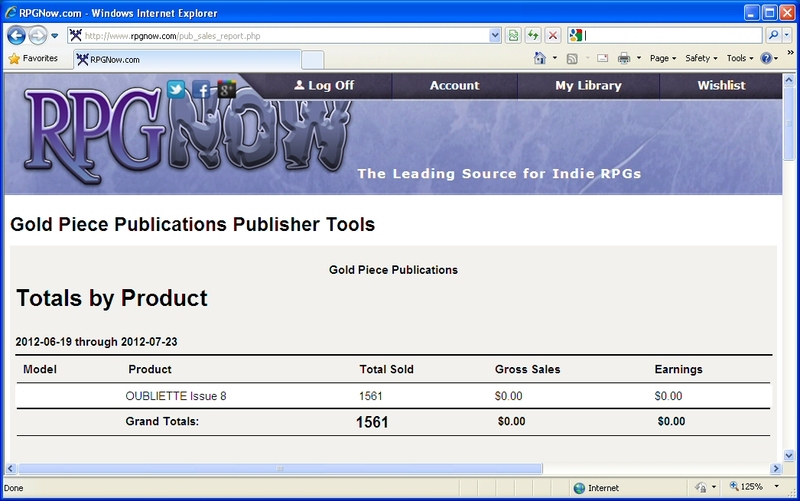 That beats the Issue 7 giveaway by just 51 copies so the growth has pretty much levelled off. I am still really pleased with the numbers though. There may be a seasonal factor involved too as looking across everything I sell on RPGNow they all sell less over the summer months. 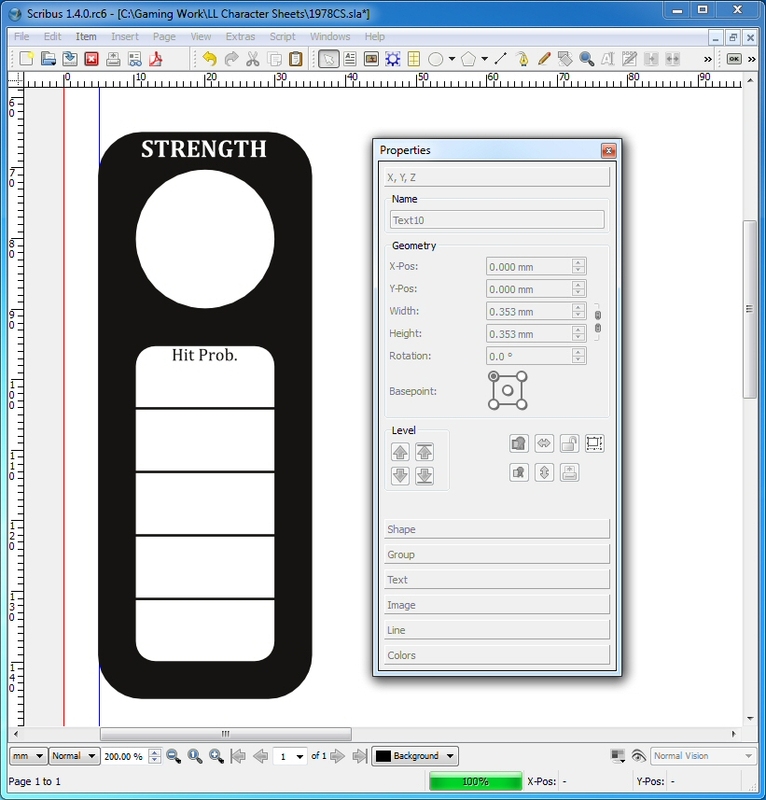 I've started work on Issue 9 and plan to release it late November/early December. 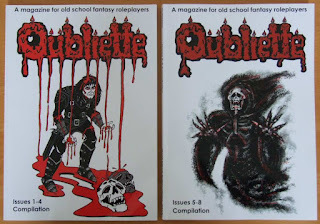 I want Oubliette to run for a long time so I'm happy sticking to 2-3 issues per year, as I think it will be more sustainable at that rate. There won't be a giveaway with Issue 9, but there will still be a launch promotion to reward existing readers and help attract new ones. Sales of the Issue 5-8 Compilation are going very well. I noticed this morning that Lulu.com have a 20% coupon SILVERUK (try just SILVER if you are not in the UK) that ends today, so if you've been waiting for one be quick. 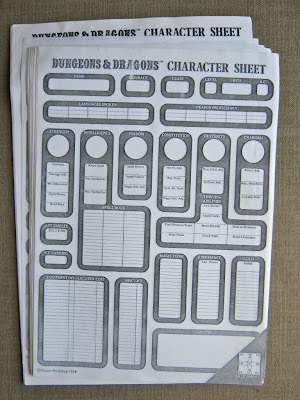 This character sheet is a reworking of a D&D character sheet produced by Games Workshop in 1978. 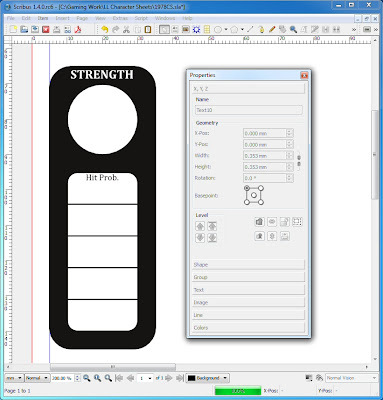 I've remade it from scratch in Scribus and exported it to PDF. It is a great sheet, but a few things struck me as strange whilst I was putting it together. Firstly, there are no sections for recording Saving Throws or Movement Rate. Also Magic Attack Adjustment (Magic Att. Adj. on the sheet) is listed under both Wisdom and Constitution so I removed it from Constitution. 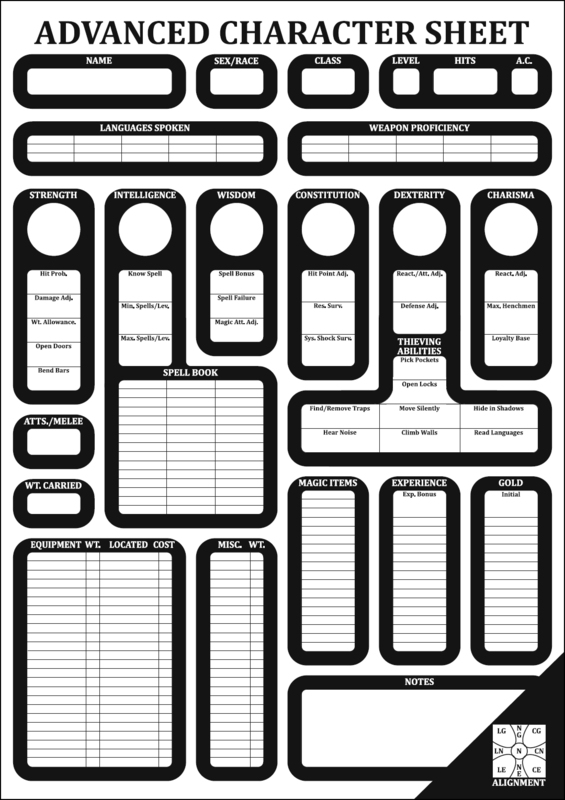 Finaly, there are spaces to record 15 languages and 15 weapon proficiencies, which seems to be overly generous on a sheet that is missing arguably more important sections. These are not major issues though, as the Notes section can take care of any extra details. I may take another look at the framework of this sheet in the future. It would be interesting to see how it would look if it were reworked for Labyrinth Lord and/or the AEC. 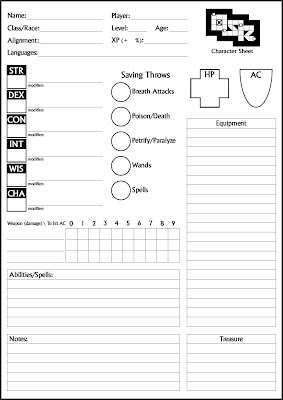 Backers of the OSR Character Sheet Campaign will get a copy of this emailed to them at the weekend. 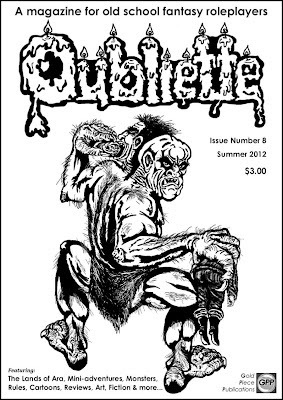 I will also include the PDF as one of the extras in Oubliette Issue 9. However, as that is a long way off, if any Followers of this blog email me (oubliettemagazineATyahoo.co.uk), then I'll send them the PDF when I do the other emails this weekend. 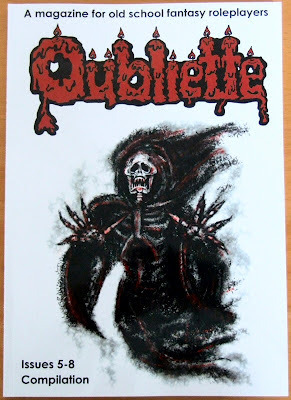 There is just 1 day left to go of the Oubliette 8 PDF giveaway promotion. Tomorrow afternoon I'll be putting the Issue back to its normal price of $3.00 so don't miss out if you have been meaning to get it. Spent a few minutes setting this out earlier today. It was suprisingly easy to mimic the 1978 version. I think a couple of hours work should see it completed. 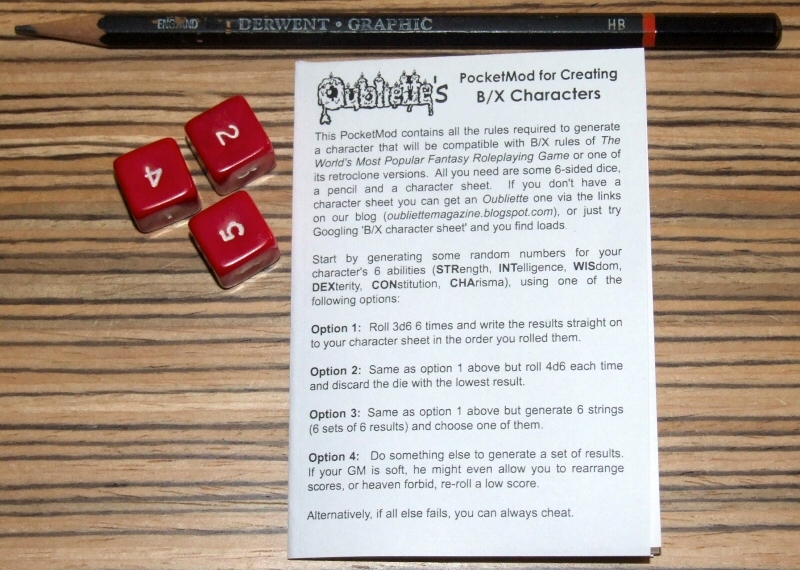 One of the extras that I am producing to go with my OSR Character Sheet Pads is a PocketMod containing all the rules required to roll up a 1st level B/X character. The folowing images show what it looks like so far. It is amazing how much you can get on to a single A4 sheet of paper. 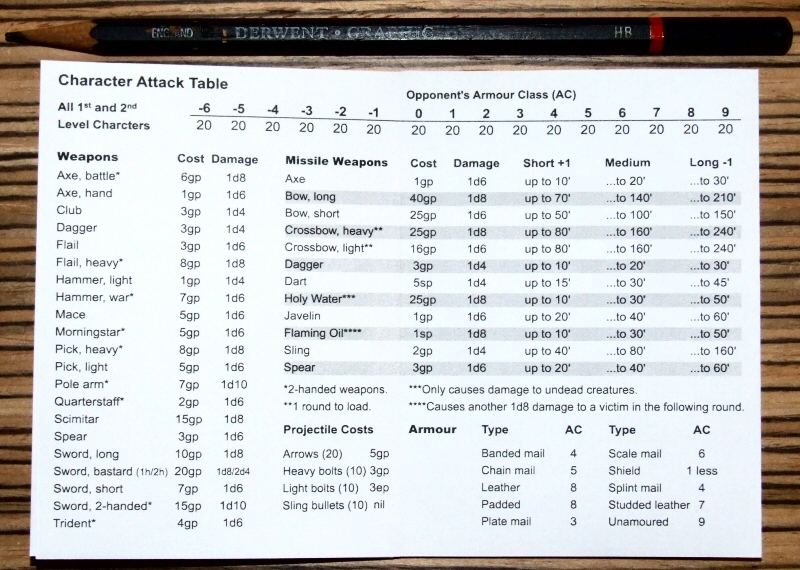 The PocketMod not only has all the basic rules for creating characters, but it also has a combat table, a saving throws table, weapon damage and even missile weapon ranges. I had planned to produce 2 PocketMods one for character generation, and a second with equipment lists. However, I surprised myself by finding space for basic equipment in addition to all the character generation rules. 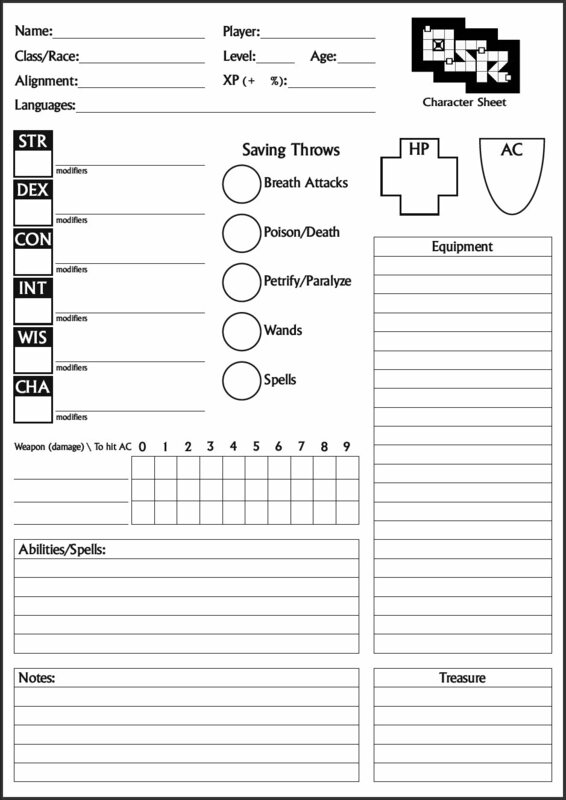 I will also be adding lists and descriptions of 1st level cleric and magic-user spells on the back so the sheet can be unfolded to look at them. 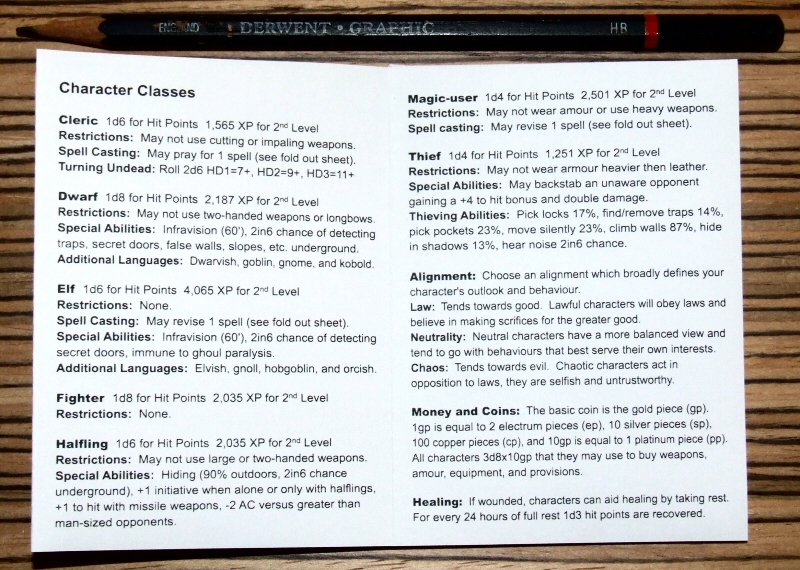 A copy of this PocketMod will be sent out with every pad of OSR Character Sheets that are currently running as an Indiegogo camapign here: http://beta.indiegogo.com/projects/110891 Even if the campaign fails to meet its funding goal I will still email a PDF of the PocketMod to all the backers. 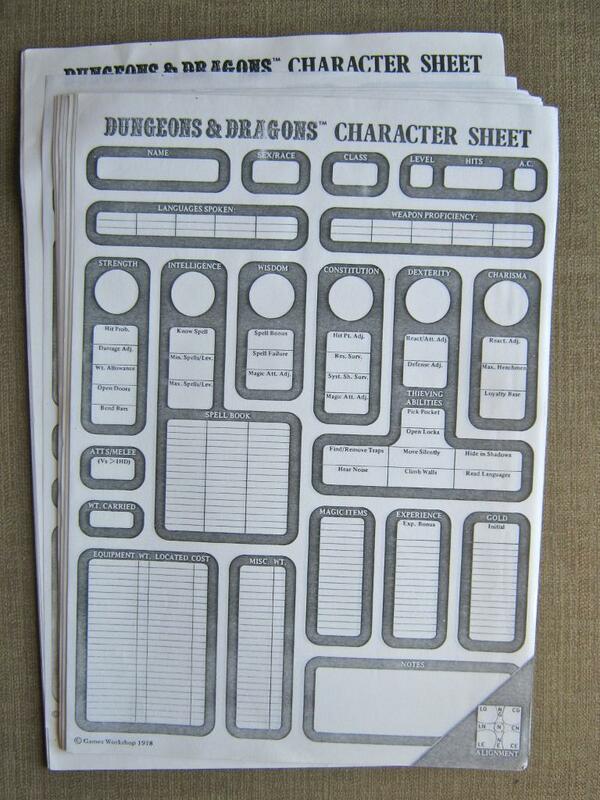 Next week I will start on my rewoking of Games Wokshop's classic 1978 Character Sheet which will also be an semi-exclusive item for my Indiegogo backers. 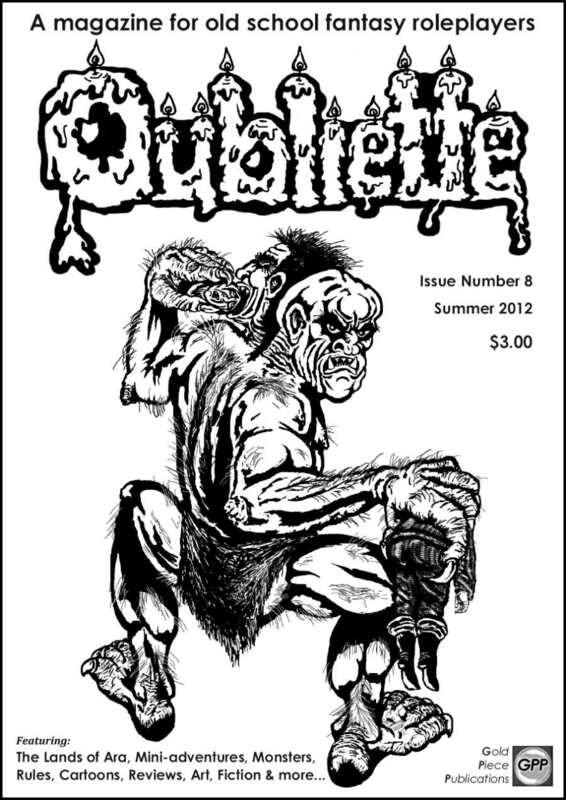 Issues 5-8 Print Compilation Out Now! The new printed Compilation containing Issues 5-8 of Oubliette is now available to order from Lulu.com. The printed Compilation of Issues 1-4 is also still available, along with individual printed editions of Issues 1-8. The new Compilation weighs in at 172 pages and costs £9.99 and the previous Compilation has 148 pages and costs £7.99. If you order by 13th July the code CAUGHTUK (outside the UK it will probably just be CAUGHT) will save you 18% on orders from Lulu.com. 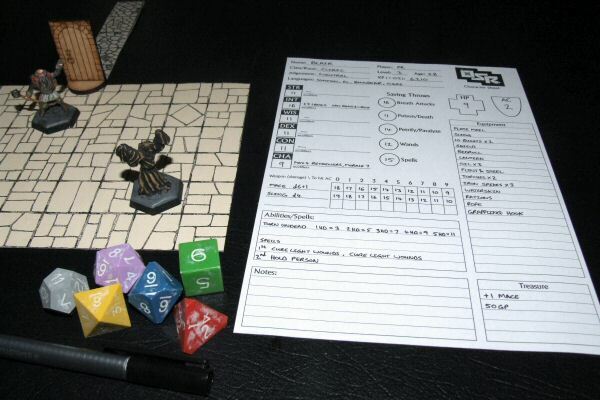 I am planning to spend a bit of time this weekend working on extras to go with my printed pads of Character Sheets. The campaign for the pads is running on Indiegogo - it has still got a good way to go to reach its goal, but it would only take another 25-30 backers to get it there. Anyway, here are the extras that every backer will get in print and as a PDF. Plus, as an extra incentive I will email the PDFs of these to all backers regardless of whether the campaign reaches its goal. 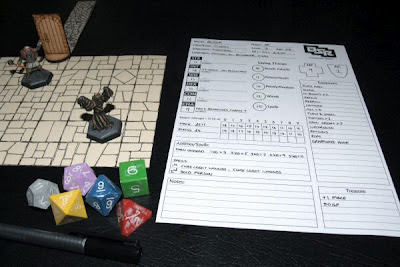 Printed Pocket Mod containing everything required to create a first level B/X character including full 1st level spell descriptions. 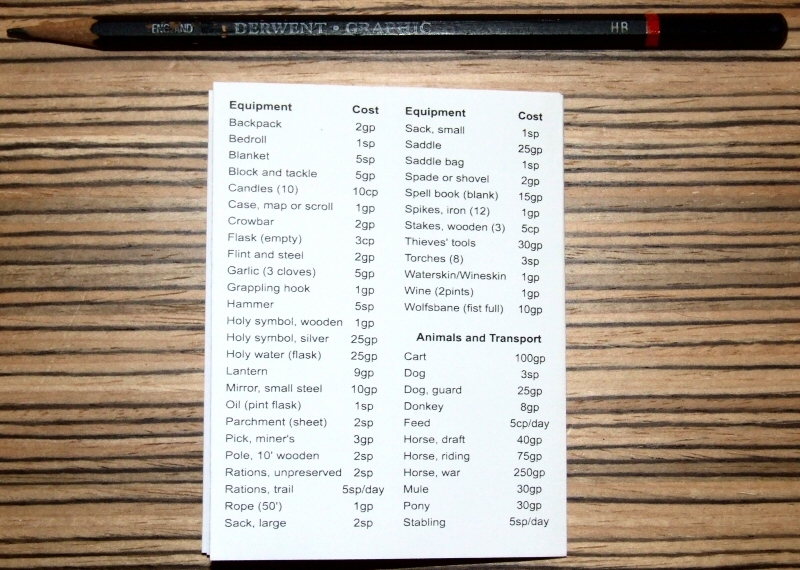 Printed Pocket Mod containing an expanded list of equipment complete with descriptions. 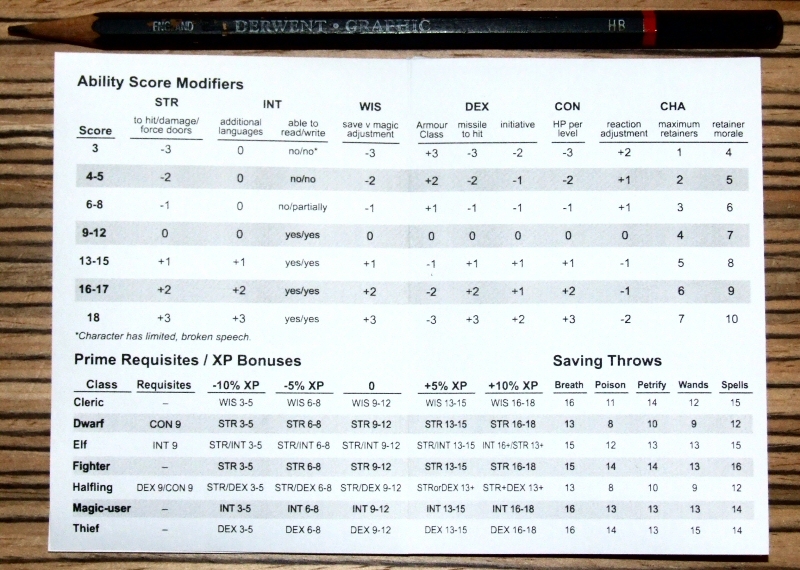 A reworking of the classic 1978 Advanced Character Sheet (see details here and here), originally produced by Games Workshop.